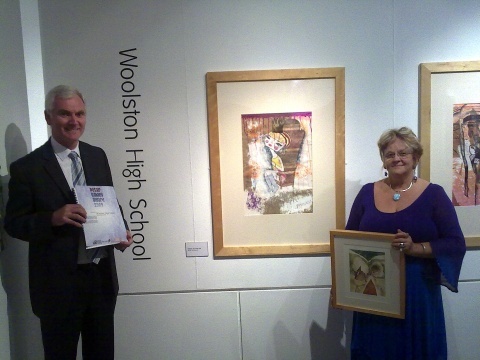 Woolston Community High School’s Art Department is celebrating its winning submission Art Network Exhibition at Warrington Museum and Art Gallery. The school was praised for the standard of its work. In particular, the judges commended pupils for the variety of the work that was submitted. Jason Thompson was awarded the runners up prize for best pupil work. The ‘Peter Oakley Award’ was presented to Mr Holliday & Mrs Sutton who represented the school. <>Mrs Sutton is pictured holding the prize which is an original print called ‘Monument’ by the artist Peter Oakley. Mrs Robinson, Headteacher, said today that as well as being a Science College and valuing Science and Mathematics the school can be judged on the success of other curriculum areas and winning the Art Nework competition was testament to the value and success of Art in the school curriculum.